I’m pleased to share some exciting news. Jordan, over at Fun, Cheap or Free is hosting a Frugality Boot Camp in Utah on June 23rd, 2012! I am partnering with her this event as one of her sponsors for the retreat. It is going to be AWESOME. If you thought going to the spa was therapeutic, this will blow your mind. Three cheers for saving money…especially in THIS economy! 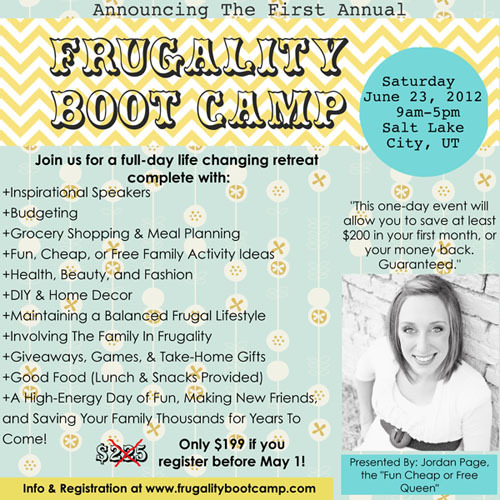 “Come be a part of Utah’s first annual Frugality Boot Camp. It’s a day-long retreat where you will be enlightened by renown guest speakers from all over Utah, showered with take-home gifts, good food, and lots of fun, and you’ll learn everything you need to know to live an overall frugal lifestyle…the easy way. It’s guaranteed that you will save your family at least $200 or more in your first month after attending the retreat, or your money back. So really, there’s nothing to lose!” Go to www.frugalitybootcamp.com or click on the poster below to register and learn more.